Frank Diana has over the years written a lot of splendid articles on the business ecosystem theme. The latest post is called Monetization Strategies in Emerging Ecosystems. In here Frank has this question: Do ecosystems represent an opportunity to establish non-traditional revenue streams (e.g. monetizing data)? I think so. One example very close to me is how merchants, shippers and manufacturers can work closely together in not only moving the goods between them in an efficient way, but also moving the product information between them in the most efficient way. This opportunity for traditional ecosystems (or value chains if you like) was recently examined in the post called Wrapping Data Around Tangible Products. There are three kinds of data monetization: Selling data, wrapping data around products and utilizing advanced analytics leading to fast operational decision making. These options were examined in the post Three Flavors of Data Monetization. Manufacturers need to streamline the handling of product information internally. This includes disciplines as PLM (Product Lifecycle Management) and PIM (Product Information Management). On top of that, manufacturers need to be effective in the way the product information is forwarded to direct customers and distributors/wholesalers and merchants as exemplified in the post How Manufacturers of Building Materials Can Improve Product Information Efficiency. Merchants need to utilize the best way of getting data into inhouse PIM (Product Information Management) solutions or other kind of solutions where data flows in from trading partners. Many merchants have a huge variety in product information needs as told in the post Work Clothes versus Fashion: A Product Information Perspective. On top of that a merchant will have supplying manufacturers and distributors with varying formats and capabilities to offer product information as discussed in the post PIM Supplier Portals: Are They Good or Bad?. Shippers may extend their offerings from moving the goods between manufacturers and merchants (or directly to end users) to also moving the information about the goods as suggested in the post New Routes for Products. New Routes for Product Information. The end goal is that the buyer personas in self-service scenarios will be able to make a fact based and full informed decision as pondered in the post Where to Buy a Magic Wand? The term data monetization is trending in the data management world. Selling data: This is something that have been known to the data management world for years. Notable examples are the likes of Dun & Bradstreet who is selling business directory data as touched in the post What is a Business Directory? Another examples is postal services around the world selling their address directories. This is the kind of data we know as third party data. Wrapping data around products: If you have a product – or a service – you can add tremendous value to these products and services and make them more sellable by wrapping data, potentially including third party data, around those products and services. These data will thus become second party data as touched in the post Infonomics and Second Party Data. Advanced analytics and decision making: You can combine third party data, second party data and first party data (your own data) in order to make advanced analytics and fast operational decision making in order to sell more, reduce costs and mitigate risks. Please learn more about data monetization by downloading a recent webinar hosted by Information Builders, their expert Rado Kotorov and yours truly here. Traditionally data quality management has revolved around making data fit for purpose in various business processes and thus data quality has contributed indirectly to business outcomes, as the business benefits were measured and harvested by results created in these business processes. This situation has also made it very hard to create distinct business cases for data quality improvement. Most often data quality improvement and related disciplines and data governance, Master Data Management (MDM) and Product Information Management (PIM) has been part of wider business cases concerning for example Customer Relationship Management (CRM) and eCommerce perhaps under an even wider specific business objective. In today’s data driven business world and drastic rising top-level appetite for digital transformation we see more and more examples of how data can be used much more directly to create business outcome through new or fundamentally reshaped business services and business models. 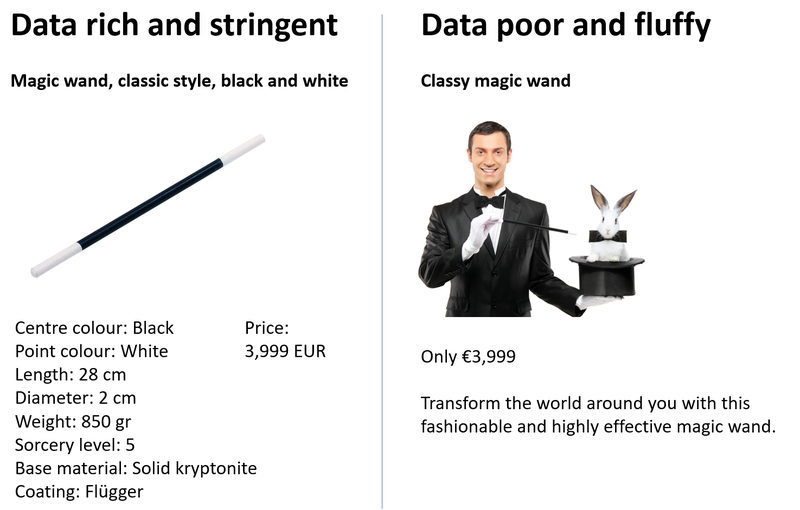 One example close to me is how data quality via completeness of product information can lead directly to selling more online as told in the post Where to Buy a Magic Wand? On the 7th August I will elaborate on these themes in a webinar together with Rado Kotorov. The webinar is hosted by Information Builders and you can learn more and register on the Data Monetization webinar here. Where to Buy a Magic Wand? Sometimes you may get the impression that sales, including online sales, is driven by extremely smart sales and marketing people targeting simple-minded customers. Bigger picture is available here. My take is that the data rich approach is much more effective than the alternative (but sadly often used one). Some proof is delivered in the post Ecommerce Su…ffers without Data Quality. In many industries, the merchant who will cash in on the sale will be the one having the best and most stringent data, because this serves the overwhelming majority of buying power, who do not want to be told what to buy, but what they are buying. So, pretending to be an extremely smart data management expert, I will argue that you can monetize on product data by having the most complete, timely, consistent, conform and accurate product information in front of your customers. This approach is further explained in the piece about Product Data Lake.